Editor's Note: Today's article comes from Marc Lichtenfeld, Chief Income Strategist of The Oxford Club and head of Wealthy Retirement. His latest research has uncovered a way for ordinary investors to collect big checks from major pharmaceutical companies. Click here to learn more. I’m a long-term investor. Like Warren Buffett, I’d love to hold a stock forever. Even if that’s not likely, I do expect to keep a stock in my portfolio for five years minimum - preferably 10. So not only do I look for great businesses, but I want to be invested in sectors with strong long-term fundamentals. I can’t think of a stronger sector than healthcare. Sure, technology is vital to our economy and is a source of growth. I like technology. But can you think of a sector whose products will be more in demand over the coming decades than healthcare? You may have heard this statistic: In the United States, roughly 10,000 people turn 65 every day. One thing we know is that the older we get, the more healthcare we consume. Whether it’s from doctor visits, prescriptions or artificial joints, older people and their insurance companies spend a lot on healthcare. In fact, the average retired couple will spend more than a quarter of a million dollars out of pocket on healthcare. And Medicare and other insurance providers will spend a lot more. It’s not an understatement when we say your health is the most important thing. So it makes sense to find the best healthcare companies to invest in for the long term. And since I’m the dividend guy, I want these top companies to pay dividends as well. Let’s take a look at a few different areas within healthcare for some ideas on where to make money over the long term. Bristol-Myers Squibb (NYSE: BMY) was founded eight years before the invention of the radio and is one of the leading biopharmaceutical companies in the world. It has 30 products on the market, including blood thinners Coumadin and Eliquis, cancer fighters Opdivo and Yervoy, and hepatitis B therapy Atripla. Additionally, it has 35 compounds being studied in clinical trials. Bristol-Myers Squibb recently scored big wins with new drugs, including Opdivo and Yervoy, that should keep revenue growing for years. That will not only reward shareholders but fund future research. Though it still has pharmaceuticals in its product portfolio, Abbott Laboratories (NYSE: ABT) is focusing more on medical devices, diagnostics and consumer products. Its consumer products division makes Ensure, a nutritional drink for adults that is often used to supplement the diet of a person who is ill.
Its vascular unit has a variety of drug-eluting stents, guide wires and other products. And Abbott’s diagnostic tools are used in oncology, genetic testing and infectious diseases. The company has been around for 125 years. The stock yields 1.9%. 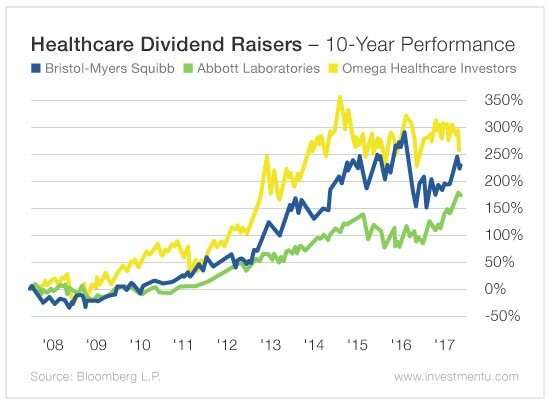 Omega Healthcare Investors (NYSE: OHI) is one of my favorite companies in healthcare. It owns real estate that is leased by nursing homes and assisted living facilities. It’s important to understand that Omega Healthcare doesn’t operate the nursing homes; it is the nursing homes’ landlord. It is expected that roughly one-third of all baby boomers will spend time in a nursing home or assisted living facility at some point in their lives. Demand for beds in these places will be huge. Omega is poised to profit on this enormous trend. The stock has a fat 9.3% yield and has raised its dividend for 15 years in a row. Healthcare stocks should definitely have a place in your long-term portfolio. The “silver tsunami” is one of the most significant trends that will affect the markets and the economy over the next several decades. These stocks and others will thrive as seniors spend more on feeling good and feeling better. And you’ll feel great generating profits and dividends from these and other healthcare stocks. P.S. The amount of money Americans spend on prescription drugs just hit an all-time high... $425 billion. But thanks to new legislation, H.R. 2430, Americans now have the opportunity to recoup the money they spend each year on healthcare expenses. To learn how you can start collecting up to $10,345 per year in “prescription reimbursement” checks, click here now.